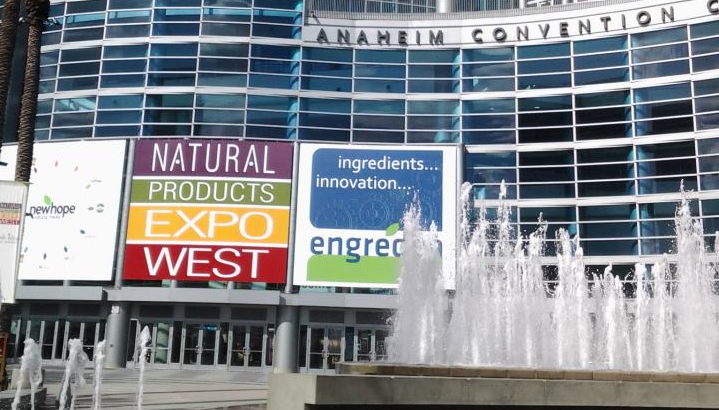 I’ve blogged now about my favorite probiotics, coconut products, and sprouted grains at the 2013 Natural Products Expo West. So I know what you’re thinking: Where’s the beef? No need to worry. This blog is called The Appropriate Omnivore, so here now are the best of the meat, poultry and dairy exhibitors found at the Expo West. Organic Valley is one of the most successful organic businesses around. Organic Valley is a co-op of organic family farms. You could say they offer the whole hog, as you can buy meat, poultry, and dairy from them, and even produce. They’re best known for their dairy line, including their grass fed milk and cultured butter. Plus they own Purity Farms, which makes an excellent tasting ghee, a clarified butter. In addition to that, they have an Organic Prairie division that sells many varieties of beef, pork, chicken, and turkey. 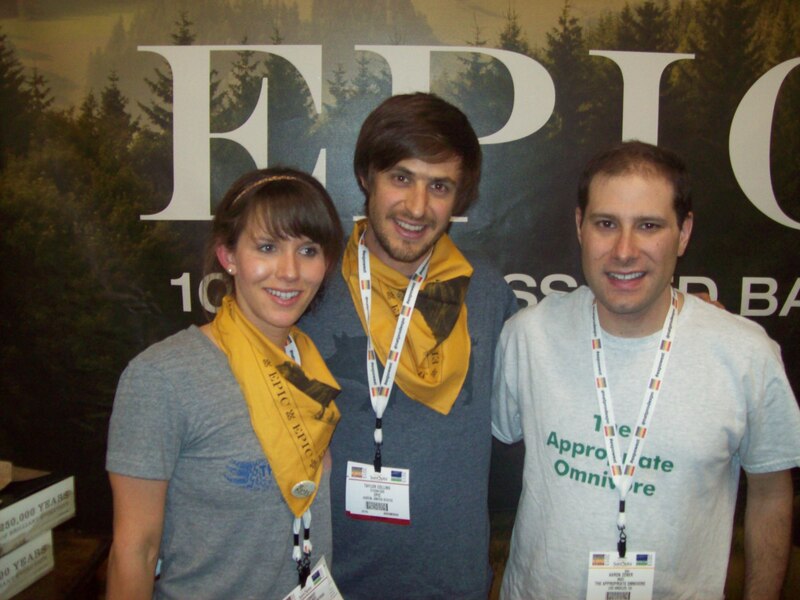 Organic Valley had a lot to celebrate at the 2013 Expo West. They launched a grass milk cheese made in California and 100% grass fed hot dogs. But to top that all off, they were celebrating 25 years in business. They threw a great party on the evening of the Saturday at the Expo, where I got to sample many of their wonderful products. 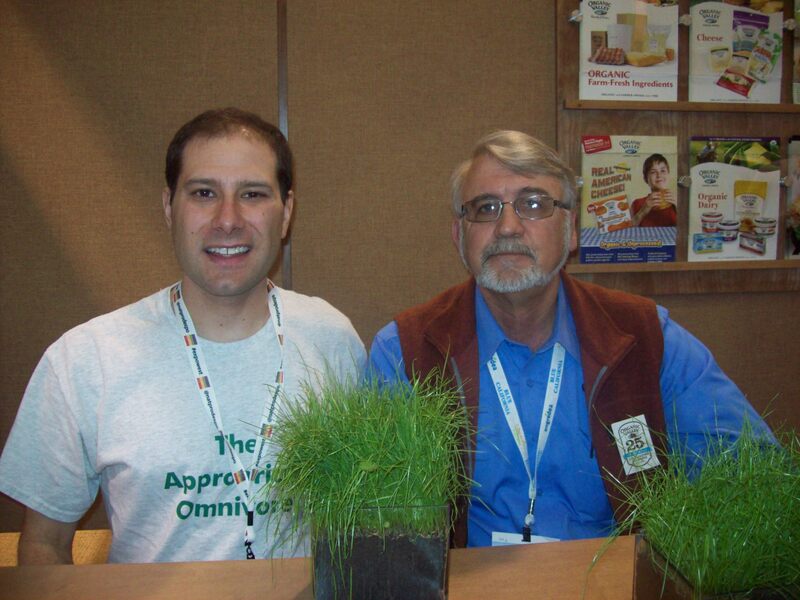 Organic Valley founder Jim Wedeberg is pictured above with me. Can meat be a snack? If you didn’t think it can, you don’t know what you’re missing. There were several great exhibitors displaying bars and jerky. These are the best of them. Epic is a recently launched company that had protein bars combining meats and fruits. My omnivore duties required that I taste each of the varieties: bison bacon & cranberry, beef habanero & cherry, and turkey almond & cranberry. All were great, but if you hadn’t figured out from my previous blog postings, I love hot peppers, so I’m partial to the beef habanero one. Owners Katie Forrest and Taylor Collins are pictured above with me. Another company that produces grass fed beef bars is Kalli Foods. Along with their bars, they also have a Kalli Jerky. The Expo was loaded with beef jerky exhibitors, but so many of them had the misused and misleading label “all natural”. Kalli’s is 100% grass fed and grass finished. They also previewed the cookies they’ll soon be releasing, which were made with their jerky and free of any grains or sugar. Yes, beef can be a dessert too. And a very tasty one at that. 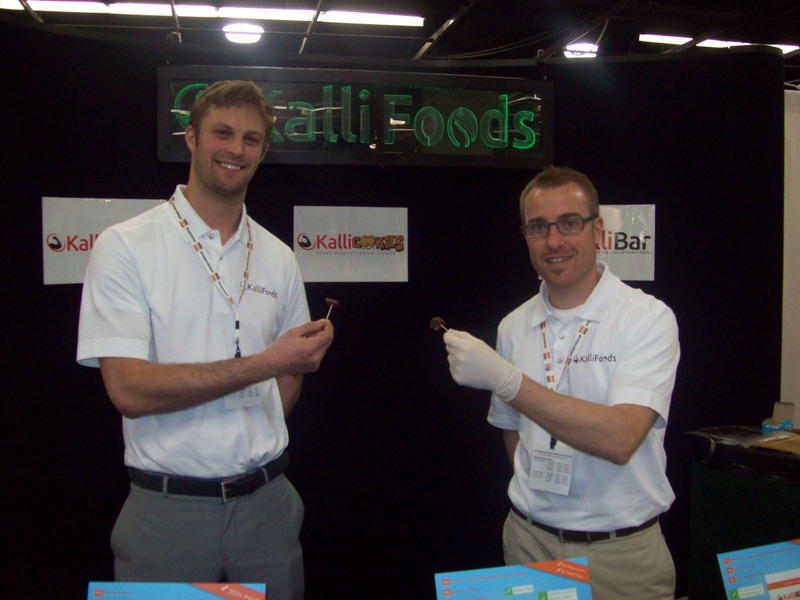 Pictured above are Kalli Foods owners Ian Smith and Jason Romesburg. When I buy my eggs, I get Vital Farms. They’re another great success story in organic foods as they’re available in supermarkets nationwide. Their eggs have a nice orange yolk and their chickens are given an all non-GMO feed. Vital Farms eggs are sold primarily at Whole Foods Market. At other grocery stores, they’re sold under the name Pasture Verde. As well as their rich tasting egg yolks, I’ve also always loved their illustrations on the eggs cartons and the little newsletters that come inside each carton. 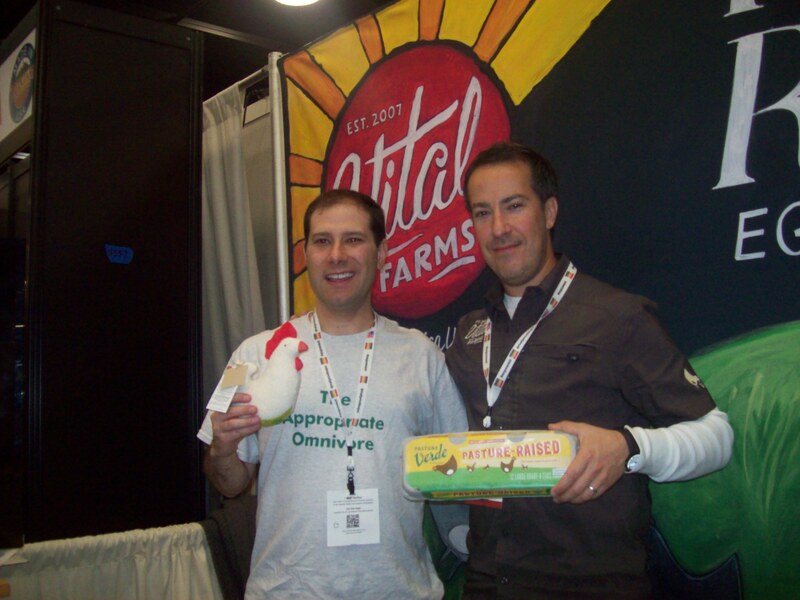 Vital Farms president Jason Jones is holding up a carton of the Pasture Verde band while I’m holding up the toy chicken behind the beautifully drawn backdrop. Did I mention how much I love their marketing and designs? 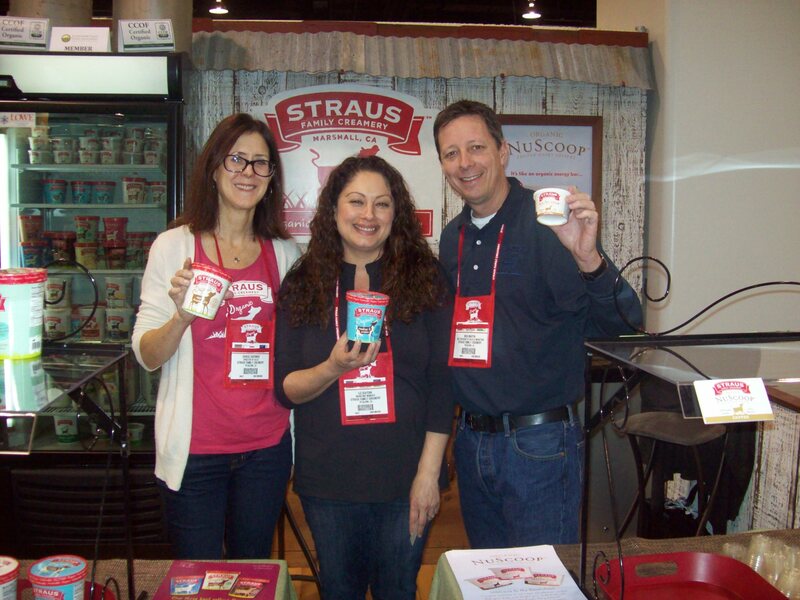 Another terrific organic company is Straus Family Creamery. Their cows are grass fed and they’re certified organic. They make numerous dairy products, including one of the few ice creams you can find in stores that contain natural ingredients and aren’t loaded with lots of preservatives. The employees at the booth hold up cartons of their ice cream and yogurt.